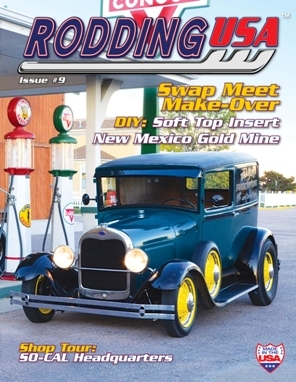 Rodding USA magazine's Issue #9 is sold out. Issue#9 kicks off with an excellent mix of features of traditional styled hot rods. Our line-up kicks off with a Al Edwards’ 1935 Ford pickup truck which has an excellent story and history behind it, then it’s on to our cover car, Gary Salter’s 1929 Ford sedan delivery before Bob Belozer’s deuce phaeton. Our masterpiece feature is Tom Reeves ’33 Ford coupe while also in the feature line-up are David Kimerlee’s ’35 Ford woody and Bill Paul’s deuce sedan. In our special features we have amazing coverage of Frank Brown’s collection of 1932 Fords and we tour So-Cal’s headquarters in Pomona. How about turning a swapmeet dog into a cool coupe, read about how a rodder’s vision gave new life to a swapmeet dog. Paul Martinez takes us inside Myron Griffin and Bill Avila’s garage and we also take a peek behind the scenes at our very own hot rod projects. On the events scene we report on Pete & Jake’s Open House celebrating 40 years of business and also the 40th anniversary or Rodders Days in Tucson, AZ. In our technical arena of how-to's we show how easy it is to get your taillights level and also how to install a top insert. There’s a lot on offer in Issue #9 as you can see, and don’t forget our regular features, opinion, art, new products, news and a list of dealers. Rodding USA, by hot rodders, for hot rodders.